Figure 1: Before image of missing via location. We've all heard of via in pad, blind vias, even buried vias, but have you ever experienced the "via to nowhere" phenomena? Well, here's how it goes. We received a distress call from a customer that found they were missing ten vias on their now populated circuit boards. The vias were supposed to connect from surface circuitry, to an internal ground layer. Every other part of the design was intact, except for the missing plated via connections. What is the best approach when trying to create a through board connection? 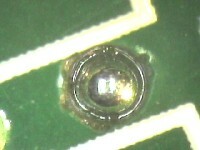 The use of a solder plated copper eyelet that is swagged into the circuit board is a common repair technique. However, sometimes the size of the hole, or thickness of the board can restrict the use of an eyelet. What then? Figure 2: Clearance hole drilled through the board, and internal ground plane layer exposed. Well, there is a fairly obscure procedure that is listed in our guidebook, 4.2.5 Conductor Repair, Through Board Wire Method. This procedure includes the use of a wire to connect through the board. In this case, the wire method was the perfect solution to correct the missing vias. The design of the board had the isolation holes drilled to .018," therefore the area for the wire to fit through the board was tight. The design also called out for several of the holes to connect to the surface, as well as to an internal plane. The repair process consisted of drilling .010" hole to allow for the installation of an non-insulated 30-gauge wire through the board. Figure 3: Wire soldered through the board to internal ground layer, and surface pad to establish the desired connection. The clearance holes were drilled through the center of the via's surface pad. The opposite side of the location was precisely machined to expose the surface of the internal plane to which the wire was to connect. This is a difficult step that is done on a precision drill system with the aid of a microscope. After both surfaces were exposed, the wire was inserted through the drilled hole and bent over to overlap onto the two exposed pads. The two points were then soldered to establish the desired connections. Final touch-up of the area included sealing the perimeter with epoxy, to secure the wire in place. 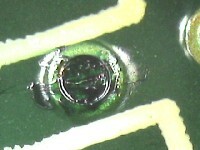 Figure 4: Mask applied to the soldered location to seal the solder joint. There have been many times when we have referenced odd IPC procedures and wondered why they were ever included in the printing of the IPC Repair/Rework guidebook. Well, as obscure as this procedure was, it turned out to be the best solution to recover these circuit boards. "We were struggling with BGA rework on four of our most complicated assemblies until we decided to send them to you. Your team has been awesome and you've come through on every project."